Every time one of our supermarkets has a good special on fresh New Brunswick salmon fillet I buy whole side and break it up myself. Also, I always call the store and ask exactly when the will receive new shipment and buy it as soon as it is available. I never buy from display case because when I get to the fish counter the salmon is still in a box fresh from a truck. First thing I do is wipe it clean and remove any bones left behind. This time I wanted to make more Gravlax so two big chunks went there with skin on. Next 2 pieces were cut for dinner that night (Pan Seared Fillet of Salmon) and tail section and belly were used for sashimi and 3 Sushi Rolls cut into 18 pieces, enough for two of us to munch on whole day! 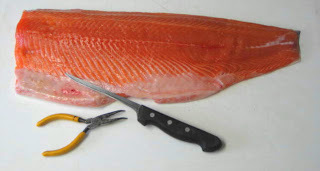 The two fillets and tail were skinned. For me, this is a way to go when it comes to salmon. I have to mention that salmon freezes extremely well. I usually freeze it in serving pieces and when frozen solid I vacuum pack. Left to right: Gravlax, 2 fillets, 2nd side for Gravlax and tail for sushi roll and sashimi. Very frugal way to buy salmon.